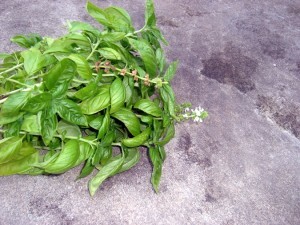 To the self-proclaimed Queen of Basil, I have a question. 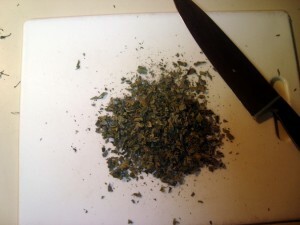 Is this herb (or is that erb?) pronounced “bay-zul” or baa-zul”? This quandry has plagued me for a number of years, and now I am confident I will finally get the definitive answer to my puzzlement from you, Oh HIgh and Exalted Herb Mistress. I would marry Basil if I could. I can’t grow herbs, instead I focus my energy on stuff that doesn’t really do much besides sit there and look pretty, you know, like my zillion orchids and roses that, well, could probably kill someone. Seriously, my roses are like attack roses. .-= Aunt Becky´s last blog ..As Thick As Blood =-. So, Im not much of a green thumb. Are you sure i wouldn’t kill it? .-= Chief´s last blog ..My Conversation with Ms. Lucifer =-. And this is why you’re much smarter than I am. I’ve been growing basil for a whopping 3 years now and have yet to realize that I could bring it inside in winter, or dry it when it gets old. 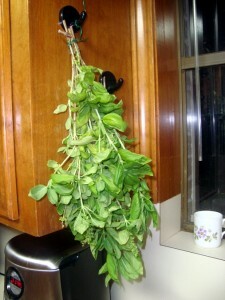 Guess what I’ll be doing with my basil tomorrow? Oh, yeh. I am. .-= Karen´s last blog ..Well Aren’t We Just All Slap Happy Today =-. SSG LOVES that idea! She may need you to write a savvy guest post! 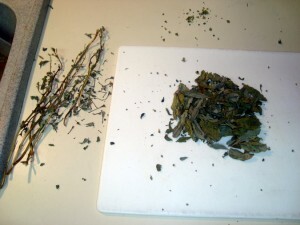 Have you been able to keep herbs alive in the winter? My kitchen window faces south and I was thinking of trying it this winter. .-= Simply Savvy Girl´s last blog ..Simple Saturday Spent … =-. My basil always got et by bugs. It doesn’t seem happy in this climate. I bought a basil plant in my Very First Grocery Shop upon moving in here. We are eating it all up, yum yum! There may be nothing left to dry… My mum plants basil HEDGES, (and that’s BAH-zil, dahling!) and of course it never gets cold there. Mine is on the kitchen windowsill next to a bright yellow orchid, where I can luuurve them all day and the frosty nights won’t get them. I also bought cilantro, and it started to DIE so I chopped it all up and used it in a fishy thing. Yum. But why, cilantro? What did I do wrong? .-= Nan´s last blog ..Quote Of The Day =-. My mother, Krissa’s grandmother, had the greenest thumb ever with my daughter a close second! Mine is brown. I can’t grow basil. I can’t grow thyme I can only grow rosemary and that is a very sad testimony. 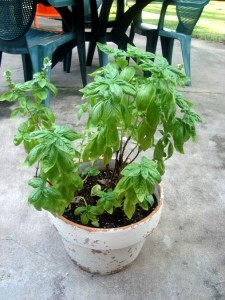 Have you grown lemon basil? It smells wonderful. .-= Ree´s last blog ..Haiku Friday – Written late on Thursday night =-. Now you’re making me all jealous that I’ve failed to even TRY to grow basil. I tried catnip this summer and couldn’t get it to dry out nicely so I gave up. .-= Hyphen Mama´s last blog ..Another unfortunate naming dilemma…. =-. .-= Kori´s last blog ..And this is what makes me happy… =-. You make me feel so inadaquate! And I probably can’t even spell it. 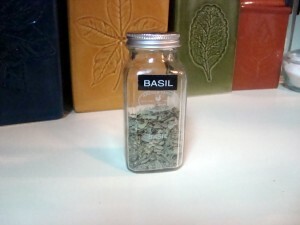 I should probably try growing something because I love herbs and spices…including basil! I love it too and am growing it at home as well! I will now steal your idea for the winter. I havent tried drying it but I will be testing it out next month. Its still 80 here. .-= JennyMac´s last blog ..Young Adult Wasteland: School is now in session =-. I am currently watching the “do it yourself/ even a child can do it / seriously, how can you fail at this” potted basil and parsley wither and die in their little pots of peat, only an inch and a half long (and it’s been growing for three months). Clearly I have messed something up. .-= mike´s last blog ..Rum Runners Relay =-. .-= habanerogal´s last blog ..My TV husband this year will be… =-.